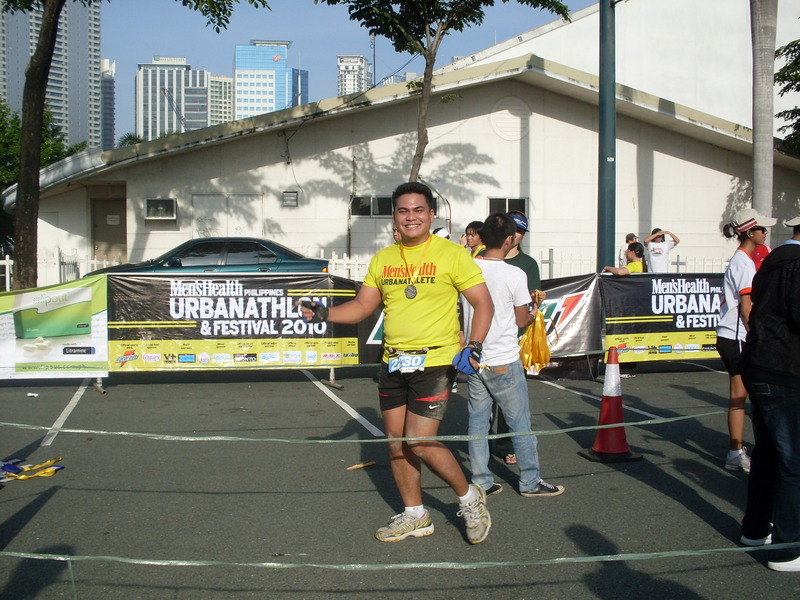 I am super proud of hubby, Noy, for finishing the Men’s Health Urbanathlon 10k! Sadly, I wasn’t able to join as I lost my race bib 😦 Actually I misplaced my free bib and hubby’s paid bib but a good samaritan by the name of Jet Paiso offered me his race bib. Thank you, thank you Jet! I would have to give a 4/5 for the race based on hubby’s experience. As soon as hubby got up, the first words that were out of his mouth were…”We have got to stop doing this!”…He hates waking up early as he loves sleeping late. Then again, after a few minutes he’s up and about, excited to run. We easily got parking as soon as we got to BGC. 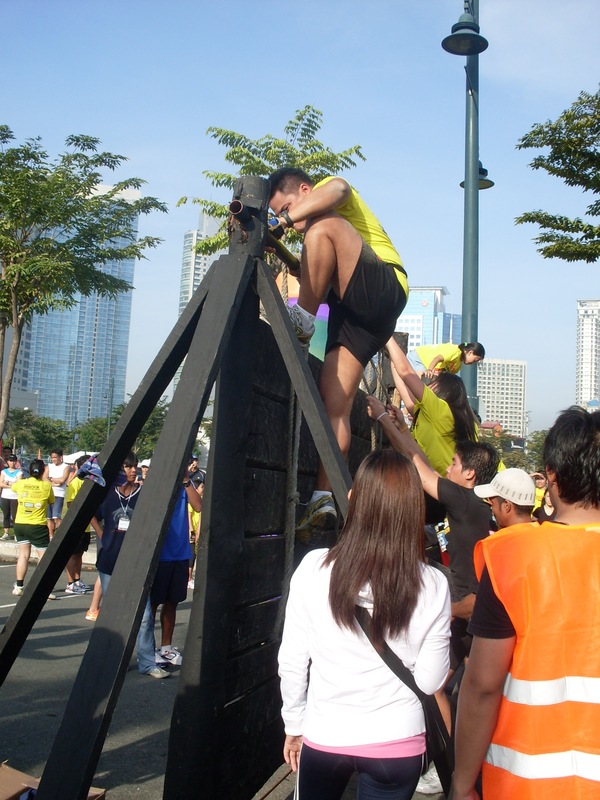 Noy was part of the 2nd wave of 10k runners so he had to wait a bit before the start. 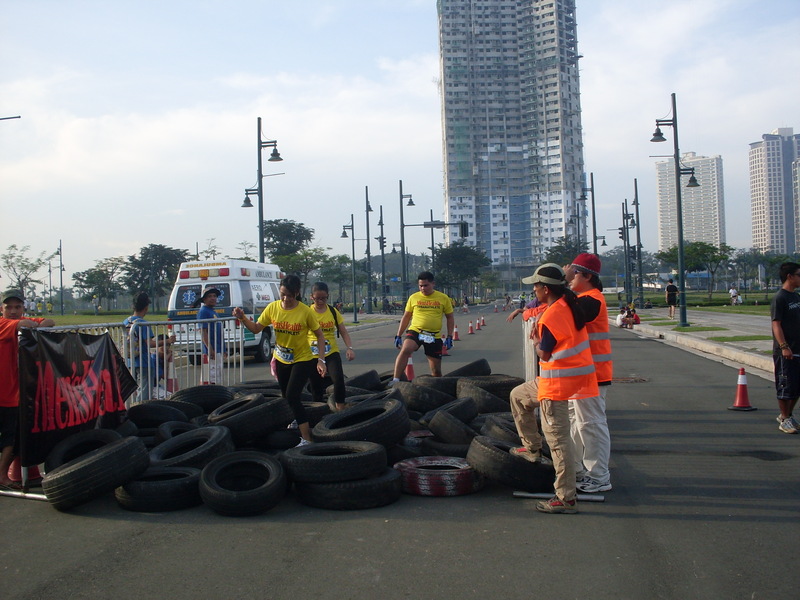 The first obstacle that the runners had to face was the tire dump. I had to stop myself from laughing at runners who fell, lost their shoe, lost their balance while traversing this obstacle. I felt so mean! Then my thoughts went to hubby. What if he falls over? I’m so sure that I would not be able to stop myself from ROFL. Finally hubby arrives and there’s no action. He didn’t even trip a bit. Darn! Maybe on the next obstacle which is the balance beam. 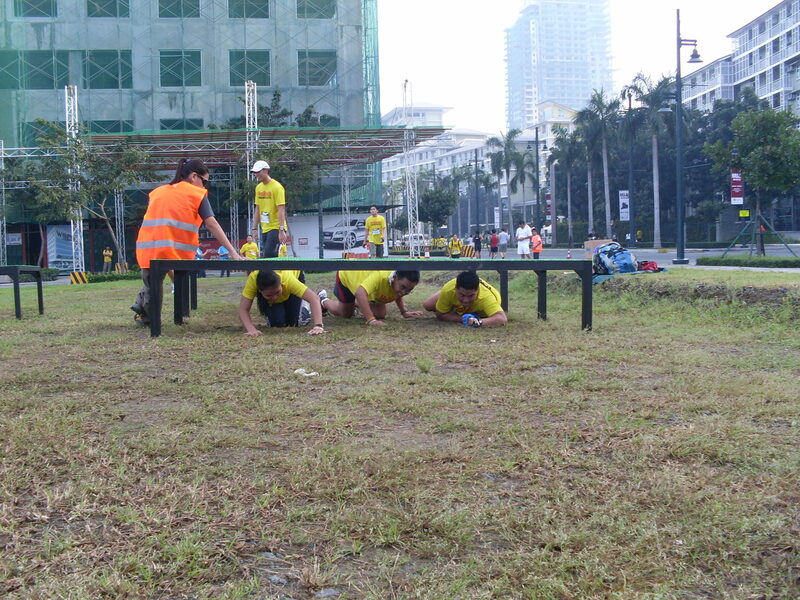 As soon as the 2nd wave 10 runners got to the balance beam, lines started to form. Uhoh, this looks like a problem. The low crawl was one of my favorite obstacles to watch. I think it’s challenging for most women to get down on their tummies and crawl on a muddy surface. Kudos for those who were able to do it! 🙂 Hubby was a FAST crawler. He didn’t mind getting all dirty at all. 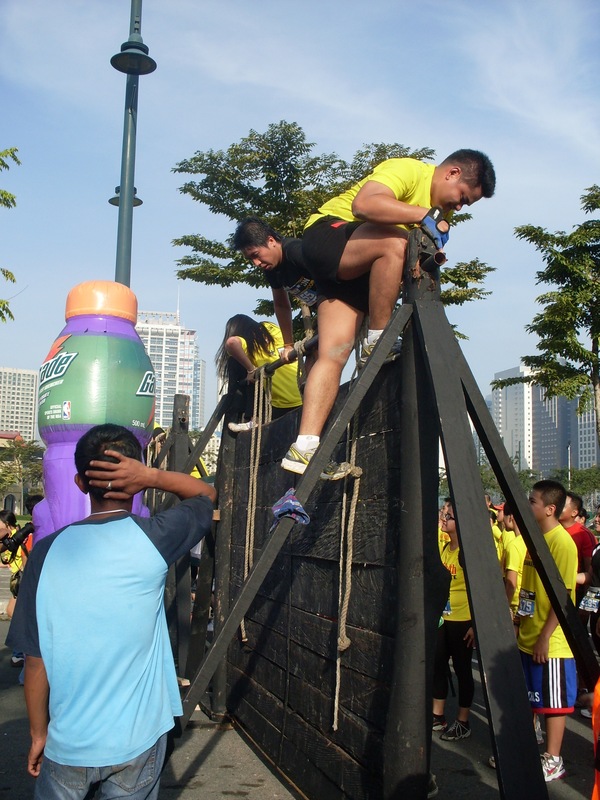 The Men’s Health Urbanathlon was a super fun race! 🙂 Hubby can’t wait for the next one. After the race, we hanged out at the takbo.ph booth where we learned that Noelle (aka Kikayrunner) won 1st place in the women’s 10k. She finished the race under an hour (53mins I think). Imagine that! I can’t even do a sub-60mins on a regular 10k run! Congratulations Noelle! Over a thousand participants ran either a 5-km or a 10-km course in the city-based, multidisciplinary race, which claims to be the most demanding Urbanathlon to date! Spotted running down the track were personalities like QTV X-Life hosts Gino De La Peña and JC Tiuseco, QTV Ang Pinaka host Rovilson Fernandez, RunnerSpeak host and blogger Noelle De Guzman, GMA reporters Nelson Canlas, Steve Dailisan, Julius Segovia, Dani Tingcungco, Mariz Umali, Raffy Tima and Kara David, Jam 88.3 deejay Hilary Isaac, and Magic 89.9 deejays Tony Toni Bueno, Sam YG and Slick Rick. Hosted by Magic 89.9 deejay and UAAP sportscaster Boom Gonzalez, the Men’s Health Urbanathlon 2010 was made possible by official sports drink Gatorade, official food sponsor Century Tuna, major sponsors V+ Jeans, MSense, Sun Cellular, minor sponsor Lipout, official heart rate monitor Suunto, official gym partner 360° Fitness Club and registration partner R.O.X. Special thanks to radio partners Magic 89.9, Jam 88.3 and RX93.1. 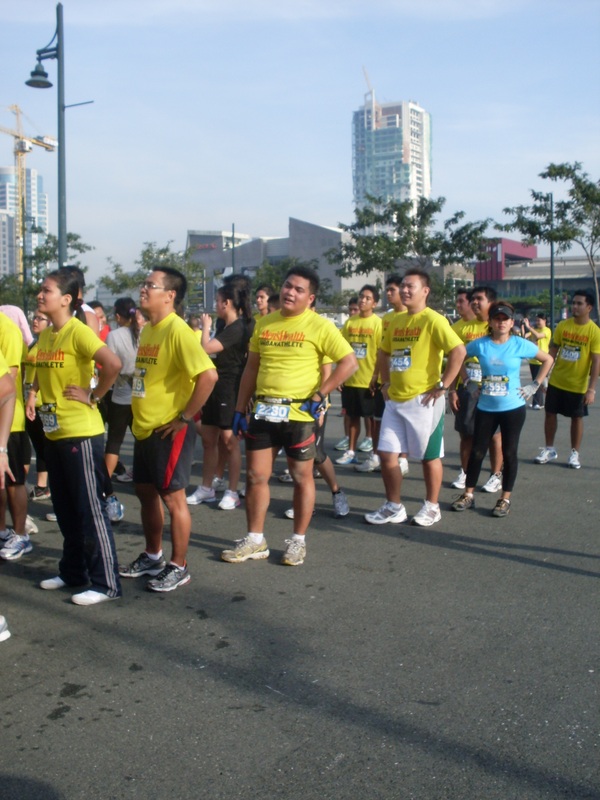 For race results, visit http://www.takbo.ph or http://www.menshealth.com.ph. 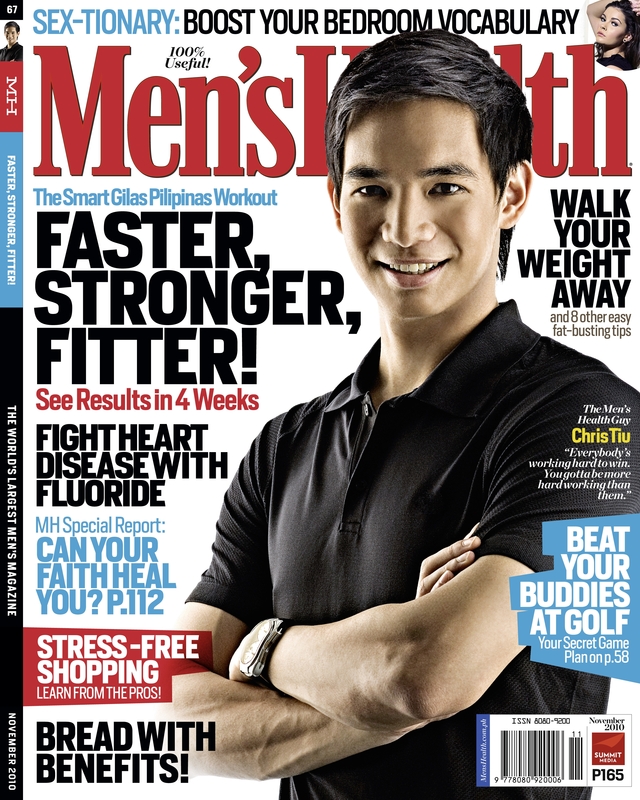 The November issue of Men’s Health features Chris Tiu on the cover is available in newsstands, bookstores, and supermarkets nationwide. Become a fan on Facebook via Facebook.com/menshealthphilippines and follow us on Twitter via Twitter.com/menshealthph. Chris Tiu, a great role model for my teeners! thanks Julie! 🙂 it was a fun, fun course!